Sautee onions, mushrooms and garlic in olive oil. In a separate lidded pan, sautee carrots and broccoli with light oil. Make sure that lid is closed for steaming effect. Cook bok choy in large pan with olive oil in med-high heat for 2 minutes. Add all ingredients to large pan including salt and pepper. Cook for another 1-2 minutes. This recipe is not really based on anything online. I just enjoy bok choy whenever I can and since my aunt is diabetic, we do our best to eat healthy. Not to mention that carrots are fantastic for your skin since they have plenty of beta carotene (yay, no more acne!). 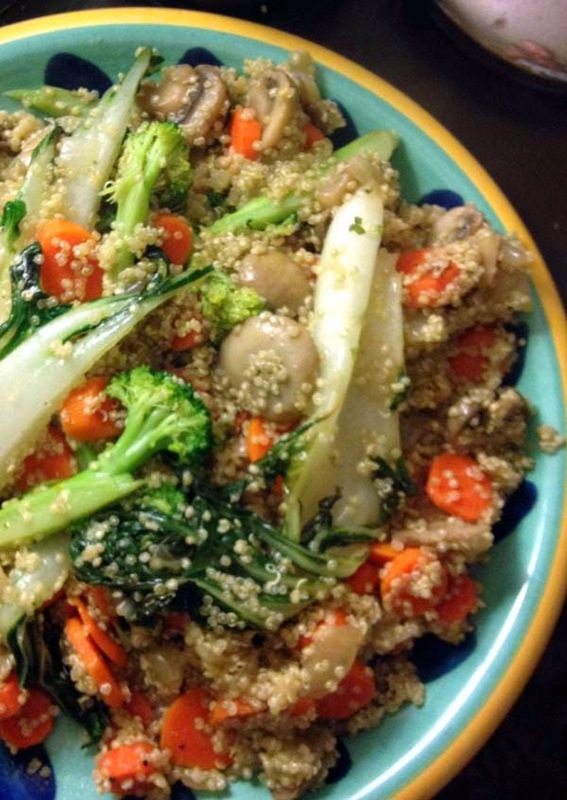 And quinoa is just a superfood that provides you with dietary fiber, protein, magnesium, calcium and more.